Spending just one day in the magnificent Napa Valley is almost torture. There are so many wonderful places to visit, narrowing it down to four or five is nearly impossible. Fortunately, we had made two appointments, so our morning was all set. To set the stage for you, my parents were very close friends with Barbara and Milt Eisele. 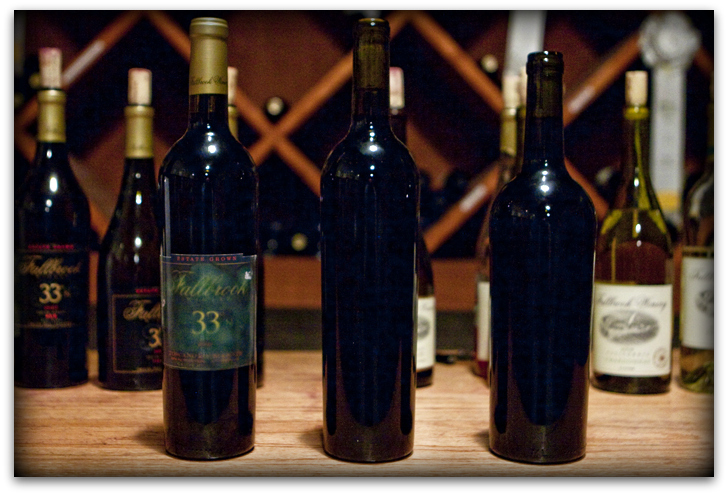 We were the lucky recipients in the 1970s of many Eisele Cabernets. I remember to this day how much we enjoyed those amazing wines. 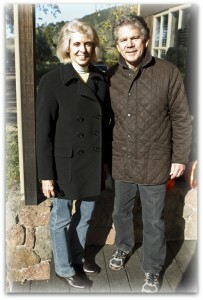 In 1990, Barbara and Milt sold their property to Bart and Daphne Araujo. The Eiseles continued to live on the property in the guest house. Milt passed away in 1996. 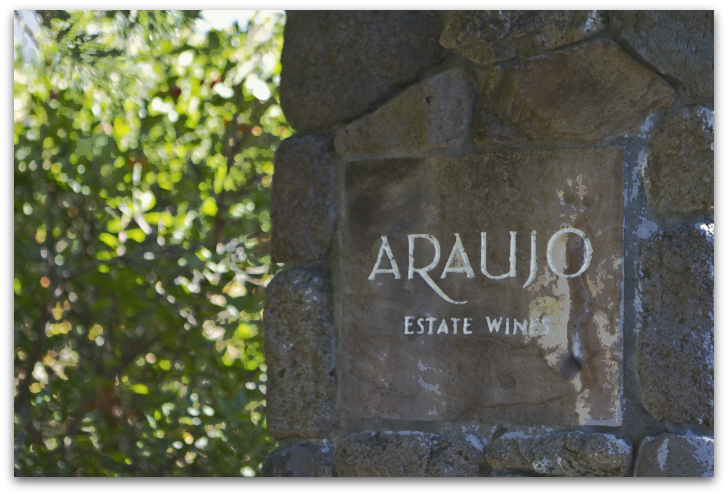 I hadn’t thought about the Eiseles or that wine until recently when I read a review of Araujo Estate Wines and noticed their fruit was from Eisele Vineyard. A visit to their website informed me the winery was not open for tours or tasting. I sent an email and mentioned our families’ connection and was invited for a visit. 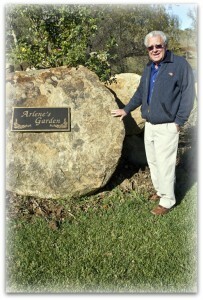 When we arrived we were met by Burges Smith, Araujo’s Vice President in charge of hospitality and customer relations. On a table in the entryway I noticed a row of bottles of Eisele Cabs from the ’70s and mentioned to Burges I remembered drinking every single one. After looking through photographs, we set out to tour the property just as the Araujos were entering the office. We had a brief visit, I thanked them for the care they displayed in maintaining the Eisele tradition and we set out for a walk through the vineyards. As we walked around memories began flooding back of visits when the Eiseles lived there. 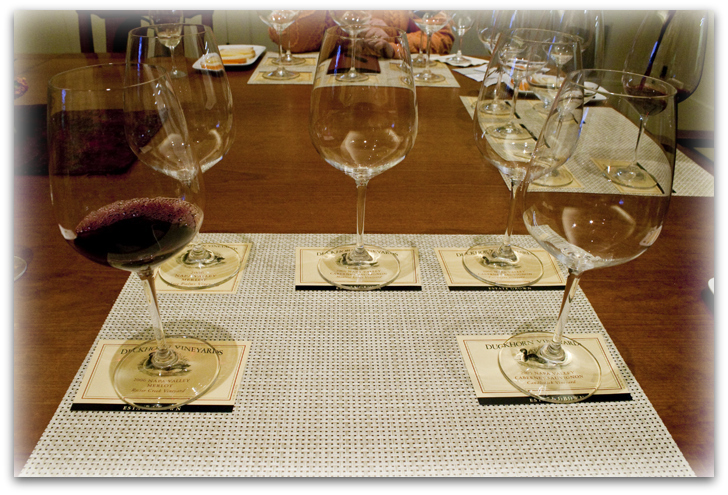 We used to come for dinner, Milt usually barbecued steaks and we enjoyed them with his exceptional wines. Burges told us how the Araujos came to purchase the property in 1990. 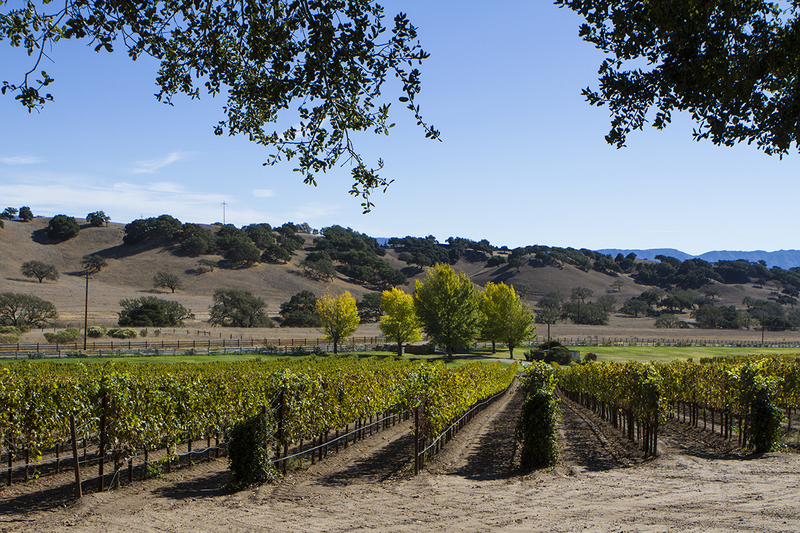 After selling one of the nation’s largest home-building companies, they decided they wanted to purchase a vineyard. They wanted an extraordinary one. When they were told Eisele Vineyard was on the market, they were excited, but knew their chances of obtaining it were slim. 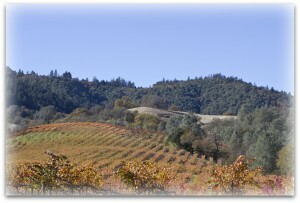 Joseph Phelps had produced several vintages of Eisele Vineyard’s Cabernet and was given first crack at the property. He turned it down, a decision he reportedly said later was the worst he had ever made in his life. The respect the Araujos show the Eisele legacy is readily apparent. The attention to detail shows in each facet of everything they do. 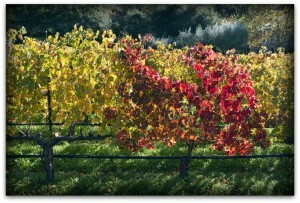 The estate is not only bio-dynamic, it is organic. They utilize the finest consultants in the world. Michel Rolland, a member of Renaissance des Appelations, lends his expertise. Matt Taylor and Francoise Peschon handle the wine-making duties. 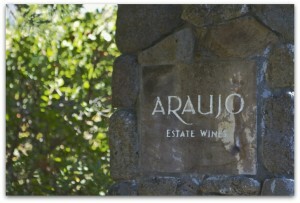 Care, I think, is the word that best defines how the Araujos respect the estate. 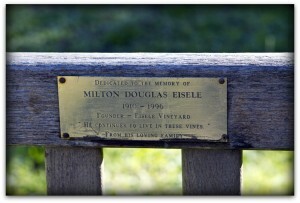 Burges walked us over to a bench dedicated to Milt’s memory by his family. 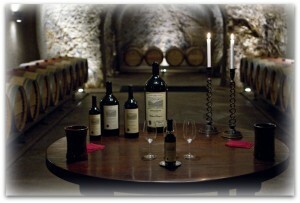 We ended the visit in the Araujo cave and had a taste of the ’07 Cabernet. 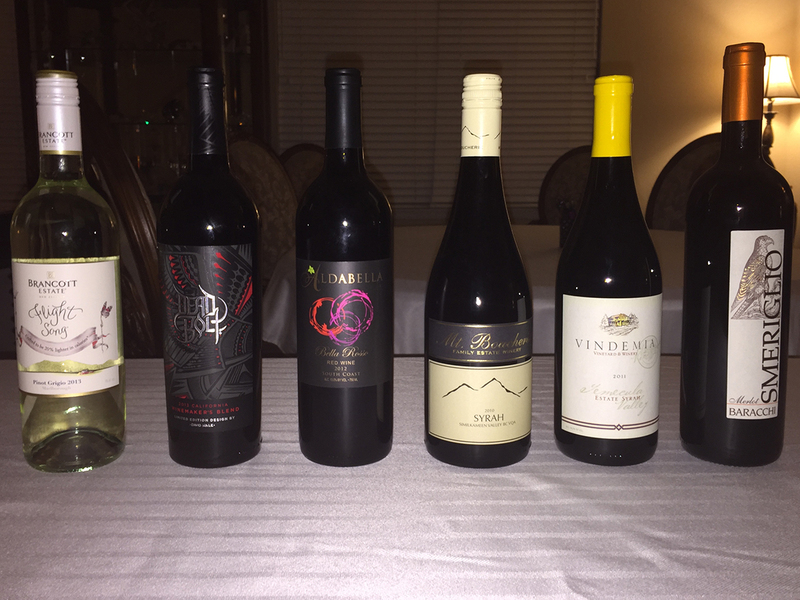 These are special wines with a special price tag: $275 per bottle. There’s nothing quite like an Eisele Cabernet and the Araujos are doing a stellar job with this spectacular fruit. Budge Brown lost his wife of 48 years, Arlene, to breast cancer in 2005. Not only did he grieve, he got pissed off and he decided to do something about it. He launched Cleavage Creek wines with the intent of donating 10% of gross wine sales to breast cancer research and support. 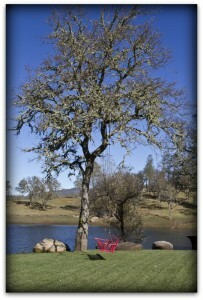 We met Budge on a clear, crisp fall day shortly after leaving Araujo Estate. It’s hard not to like Budge. He’s turned tragedy into a positive force. The Cleavage Creek labels are graced with breast cancer survivors on the front and their stories on the back. There’s a choices page on the website letting women know there are alternatives to conventional medicine and urging them to become educated. To date, Cleavage Creek has donated more than $70,000 to the fight against breast cancer. The tasting room is brand new and it’s beautiful. 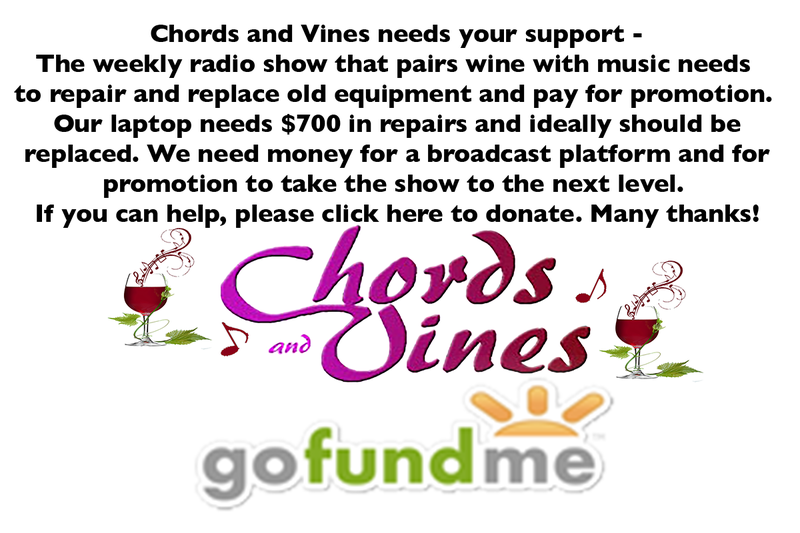 The wines are well crafted and it’s nice to know each sale contributes to help put an end to breast cancer. We plan to return in March to see the tens of thousands of daffodils Budge has planted on the property. We bade our farewells to Budge and his crew and grabbed a quick bite to eat. 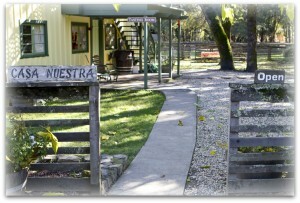 Casa Nuestra Winery had been recommended to us and I liked their tagline: dog and goat friendly. We drove in and fell in love with the look and feel of the place. We felt as if we were walking into someone’s charming home. Steve Rummel was behind the bar and we heard the dis-embodied voice of co-owner Katrina Kirkham, busy at work in the back. If you want glitz, glamour and pretense, just turn around and walk away. You won’t find it at Casa Nuestra. It’s cozy, the wines are good and there’s history everywhere you turn. Nava and A. J. are the resident Nubian goats. Total production is less than 2000 cases. 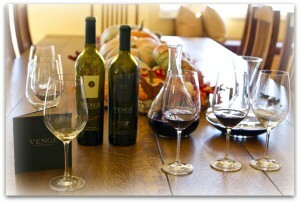 Steve suggested we visit Venge Vineyards. 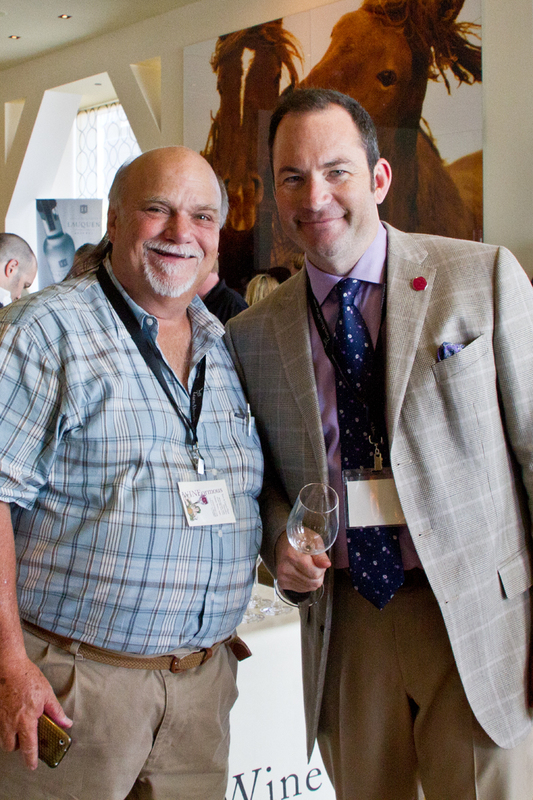 Winemaker Kirk Venge’s father Nils is the stuff of legend in the Napa Valley. 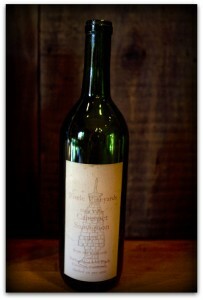 His 1985 Groth Vineyards Cabernet Reserve received a 100 point score from Robert Parker. 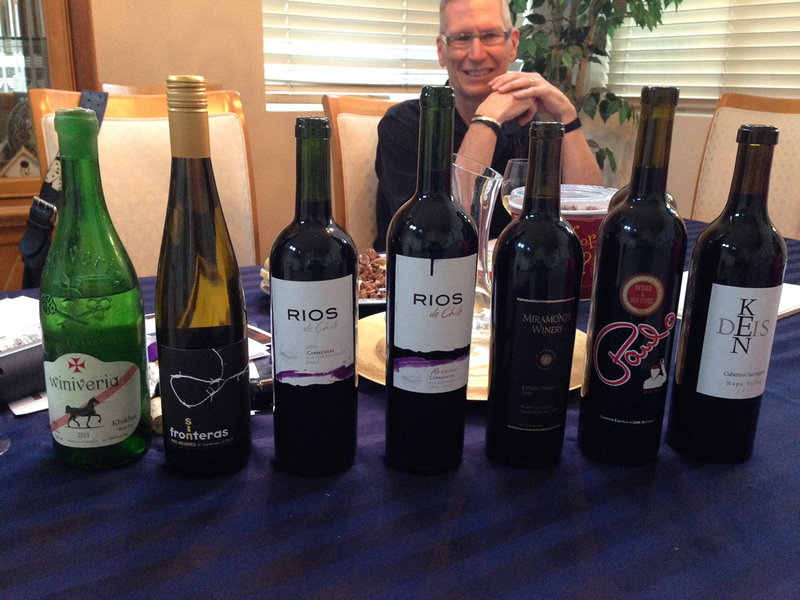 Kirk followed in his dad’s footsteps and is producing exceptional wines on the Silverado Trail. Once again, we weren’t sure if we were entering a tasting room or someone’s home. Kirk’s wife was in the kitchen getting ready to host Thanksgiving dinner. Jason Williams, Director of Sales & Operations, came out and greeted us, poured us a glass of Champ des Fleurs, their proprietary blend of Chardonnay, Sauvignon Blanc and Viognier and we took a walking tour of the property. If you get the opportunity to taste this wine, don’t pass it up. It’s extraordinarily good. The facility is new, and when we visited they weren’t quite ready to host visitors. They should be fully up and running by early spring, 2011. We went back into the tasting room and Jason decanted the 2008 Bone Ash Vineyard Cab and the 2008 Silencieux Cab. He also poured the 2008 Muhlner Steps Vineyard Syrah. It’s clear Kirk payed attention when his dad was teaching him the art of crafting wine. We loved every one, and we are quite anxious to return in the spring. 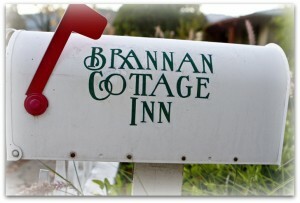 Our home away from home during our brief visit was the Brannan Cottage Inn in Calistoga. Owners Doug and Judy Cook run this 1860 Victorian. They weren’t in when we arrived, but the fireplace was burning in our room and everything looked delightful. We settled in for a good sleep and awoke the next morning to meet Judy and Doug. They’re a gracious couple and I can’t recommend a place more highly for people visiting the Napa Valley. The lobby is filled with 2 for 1 coupons for wine tasting and brochures of various wineries. We enjoyed a breakfast of fresh fruit, muffins, French toast and sausage and took off for San Francisco. Any time of year is a great time to visit, but the colors of fall and the crisp weather make it an ideal time. 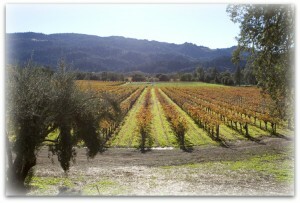 Thanks for copying us on your wonderful “day in Calistoga” report. I haven’t yet been to a couple of the wineries you mentioned, but I appreciated the historical angle and will try to visit soon. Thanks also for your comments on your stay with us. We enjoyed having you. And hope you can return sometime soon. My pleasure, Doug. We will definitely call you when we come back. Merry Christmas and Happy New Year.